), sold on two occasions at the fair in 2010 and 2011, was later revealed to have been stolen in the early nineteenth century. As the newswires reported yesterday (and which I blogged here), the painting of Christ carrying the Cross by French Baroque artist Nicolas Tournier was, according to the French state, stolen from the Musée des Augustins in Toulouse in 1818. When the picture turned up on the stand of London Old Master dealer Weiss at the recent Paris Tableau art fair, the French government immediately stepped in to try and confiscate the picture. It was reported that an export block would be placed on it. 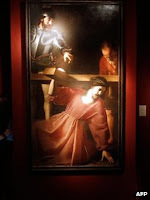 It was also reported that Weiss had bought the picture from French dealer Didier Aaron at TEFAF Maastricht in 2010 and then offered it on their own stand at TEFAF in 2011. The Art Loss Register has now written to Messrs Weiss and Aaron (below) to reassure them that the picture was checked by their staff on both occasions, neither of which revealed any problems with its provenance. At present, the ALR’s records do not extend back as far as 1818. 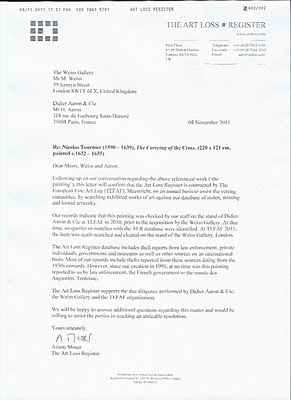 This would seem to indicate that some improvement in communications is required between agencies like the ALR and those state bodies who see a duty to intervene when problematic pictures appear at art fairs in their jurisdiction. It is embarrassing for the dealers and it is embarrassing for the ALR which, on this occasion, seems to have done what it was required to do. How far back should stolen art databases go? The Tournier picture may have been stolen way back in the mists of the early nineteenth century and a statute of limitations may have expired long ago; but the theft remains part of its provenance. Information on the 1818 theft ought to be included in the painting’s historical profile. That data can only be acquired and incorporated if data companies work proactively with state departments to blend all the known data. That might be a step towards an even more comprehensive process of Due Diligence. 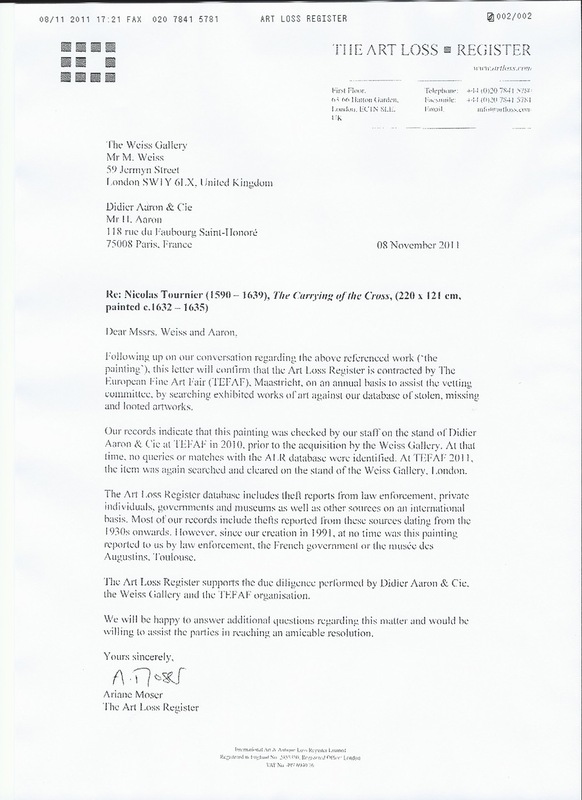 tomflynn: Art Loss Register defends its Due Diligence vetting at TEFAF.